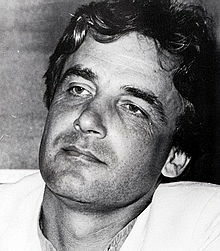 Andrzej Żuławski (Polish: [ˈandʐɛj ʐuˈwafskʲi]; 22 November 1940 – 17 February 2016) was a Polish film director and writer. He was born in Lwów (Lviv), Ukrainian SSR (now Ukraine). Żuławski often went against mainstream commercialism in his films, and enjoyed success mostly with European art-house audiences. In the late 1950s, he studied cinema in France. His second feature The Devil (1972) was banned in Poland, and Żuławski went to France. After the success of That Most Important Thing: Love in 1975, he returned to Poland where he spent two years making On the Silver Globe (1988). The work on this film was interrupted by the Polish authorities. After that, Żuławski moved to France where he became known for controversial and violent art-house films. Żuławski is also known for his work with actresses including Romy Schneider, Isabelle Adjani and Sophie Marceau. His films have received awards at various international film festivals. Żuławski had also written several novels, for example: Il était Un Verger, Lity Bór (a.k.a. La Forêt Forteresse), W Oczach Tygrysa, and Ogród Miłości. Żuławski was an assistant of Andrzej Wajda. When his second film The Devil was banned in Poland he decided to move to France, where he made That Most Important Thing: Love (1975) with Romy Schneider. After returning to Poland he worked for two years on a film which the authorities did not allow him to finish (On the Silver Globe), based on a book by his great-uncle Jerzy Żuławski. Since then he has lived and worked mostly in France, making art films. Being a maverick who always defied mainstream commercialism, Żuławski enjoyed success mostly with the European art-house audiences. His wild, imaginative, and controversial pictures have received awards at various international film festivals. He also wrote the novels Il était Un Verger, Lity Bór (a.k.a. La Forêt Forteresse), W Oczach Tygrysa, and Ogród Miłości. In 2006 he was the Head of the Jury at the 28th Moscow International Film Festival. Żuławski worked many times with composer Andrzej Korzyński (from The Third Part of the Night in 1971 until Cosmos in 2015). He had three sons from different relationships. Żuławski's ex-wife was Małgorzata Braunek, who is a Polish film and stage actress. Their son Xawery is also a film director. He was in a relationship with the French actress Sophie Marceau for sixteen years, with whom he made four films over a 15-year period (L'Amour braque, My Nights Are More Beautiful Than Your Days, La Note bleue, Fidelity). They had a son Vincent together. They broke up in 2001. On 17 February 2016, Żuławski died at a hospital in Warsaw from cancer. ^ Mira Liehm; Antonín J. Liehm (1980). The Most Important Art Soviet and Eastern European Film After 1945. University of California Press. p. 378. ISBN 978-0-520-04128-8. ^ a b Atkinson, Michael (2008). Exile Cinema Filmmakers at Work beyond Hollywood. SUNY Press. p. 79. ISBN 978-0-7914-7861-5. ^ María Luisa Amador; Jorge Ayala Blanco (2006). Cartelera cinematográfica, 1980–1989. UNAM. p. 425. ISBN 978-970-32-3605-3. ^ "Uncompromising Polish film-maker Andrzej Żulawski dies". Polish Radio. Retrieved 2016-02-17. ^ "Nie żyje reżyser, scenarzysta i pisarz Andrzej Żuławski". PolskieRadio.pl. Retrieved 2016-02-17. Wikimedia Commons has media related to Andrzej Żuławski.